One consequence of my bad blogging month (or will it turn out to be a longer stretch of bad blogging?) is that I didn’t get around to commenting three weeks ago on the astonishing NYT article about the discovery by upper east siders of lower Manhattan real estate. What’s astonishing is that we’re not talking about people moving from the upper east side to lower Manhattan. We’re talking about people buying second (or third or fourth or whatever) homes there. Yes, a coop just four or five miles away from their principal residence. Many uptown adherents now [embrace] downtown neighborhoods that would once have been considered unthinkable. It’s perhaps worth noting that one doesn’t need to go down to the Village to eat at Sant Ambroeus. 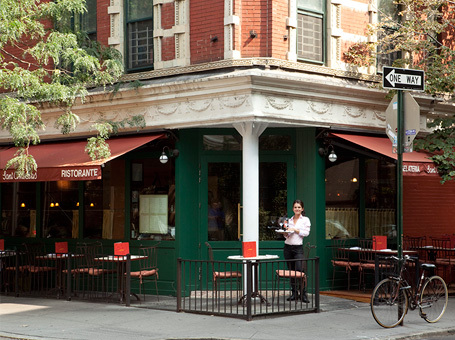 A Sant Ambroeus sibling is conveniently located in the heart of the upper east side, on Madison between 77th and 78th. I’ve written about it several times, most recently here. Some have gone beyond the pied-à-terre stage and made the move. For Suzanne Cochran and her husband, Robert, … it was a downtown soiree some years ago that persuaded them to buy a pied-à-terre in TriBeCa. “We were at a friend’s party,” Ms. Cochran recalled. “She is a very downtown girl, and it was all my favorite kind of people: artists — cool, hip people. And we were the only ones who lived on the Upper East Side.” At the time they were living on 84th Street and Park Avenue. The couple … soon bought a 5,500-square-foot loft and began alternating on the weekends between the loft and their home on Long Island. Last year, they sold their uptown home to move downtown full time. As the article draws to a close, we are warned that this all may pass. I’m glad the NYT is on this. Now a small confession. Here in Seattle, I’ve imagined life with a downtown pied-à-terre. Not that I seriously think we have need of a place to stay after the symphony, rather than making the four-mile drive home, though the parking space that would come with our condo sure would be handy. The point is, when I get to thinking what would happen if Jessica were to vacate her Belltown condo just blocks from the symphony and art museum and surrounded by many fine restaurants, that’s when I imagine life with our very own pied-à-terre. Until last month, those imaginings would end the moment I remembered our dear sweet Emma, who wouldn’t enjoy spending the night without us. Now that she’s gone, why adopt a new cat when we can have a condo?